Working for the past fifteen years on important questions of western Oregon history. I have found that much of what we understand as the history of tribes is in fact mythologies of previous generations of historians and other social scientists. The phenomenon is as yet unstudied comprehensively but time after time I have encountered historic accounts in the history books which do not align to the primary historical records. How is this to be? How is it possible that history is written wrongly and then accepted for over 100 years as “The history of the tribes”? For many years I have wrestled with this question. The issue if the truth of history is not either wrong or right, but more nuanced than that. This summer I was reminded by some of the most renowned historians, that history as written is always inaccurate, because each generation adds context and information to the histories and changes them. Then history written by human will be naturally biased and therefore untruthful in several dimensions. In fact history will never be completely truthful, because the writing of it is an inexact narrative of the actual events. Still more, is the fact that we all make errors because the process of writing is laced with opportunities to make human errors in the writing and editing processes. So we understand that there are many ways to interpret written history. Historians try to get the history as accurate as possible, but ultimately their attempts will fail. So then this becomes a practice of failure with each successive generation adding new layers of untruth to the previous generations of writing. I can attest to this because I have recently made some errors in my own writing and editing. I made at least two serious blunders in the last two major articles of 2014. The first is in the Oregon Historical Quarterly where I wrote the date of the Oregon Treaty as 1849, when it is factually 1850. That article is “Four Deaths: The Near Destruction of Western Oregon Tribes and Native Lifeways, Removal to the Reservation, and Erasure from History by David G. Lewis“. I have written about the article in a previous post on this blog. Then at the recent issue of the Willamette Valley Voices, I did not correctly identify one person in a photo. These errors have been noted and corrected in online versions but the published record will carry these errors forever. Along with this, I have begun rereading histories I wrote and published just six years ago and found that I would not write the same thing today. In that time I have advanced my understanding and knowledge of historic information such that I have a completely different understanding of these historical events only six years later. So history writing is not an event, but a process of research into new understandings. When the difference between the old and new is significant enough then a new history is written, beginning the process over again. All we can really count on is that the addition of more voices and perspectives will help mitigate and add legitimacy to our histories. The perspectives are new dimensions in history, new levels of understanding that intersect with history and culture to create greater understandings of peoples lived experiences. This is the process that we are engaged in. A recent book about the Chinook People does exactly this. 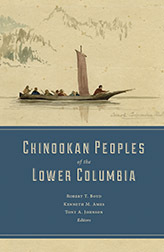 Chinookan Peoples of the Lower Columbia is a huge compendium of information from numerous perspectives about the history and cultures of the Chinookan peoples. This 10+ year project offers native and non-native perspectives on a range of historical, anthropological, linguistic, artistic, and federal topics. The book is an anathema among such books today, as it is tough to sell such a large book to a press. They do not see these books as money makers (by January 2015 it had sold 1000 copies of the Hardcover). Still it was published and in immensely valuable to the tribes and communities of the Pacific Northwest. The Press is now publishing a softcover version, which will be more widely available because the cover price will be lower. I was given a review copy in about 2009, after the book had been in process for some eight years. At least two of the co-authors died during this period, Wayne Suttles and Dell Hymes. I have used both authors’ work in my research, and I met Hymes in 1999, and corresponded with him, until his death in 2009. After my review I suggested to the editors that they include more Native perspectives of the history and cultures described in the region, as well as include at least one article about the Chinookan peoples of the lower Willamette. These suggestions were accepted, and were found to be important additions, closing a cultural and historical gap in the book, and bringing a necessary diversity of perspectives to the scholarship. The book by this time was already very large, and yet the editors argued for the additional content with the UW Press, and were successful. I was honored to work with the editors, Bob Boyd, Ken Ames and Tony Johnson to get more tribal perspectives into the volume. I was privileged to be a writer and editor for one chapter in the book, Honoring Our tilixam: Chinookan People of Grand Ronde / David G. Lewis, Eirik Thorsgard, and Chuck Williams (Chapter 15). I worked with Thorsgard and Williams, both members of the Grand Ronde Tribe to meld together a nuanced history of the Chinookan peoples from the Tribe’s ceded lands. We addressed how our ancestors’ histories intersected with the Grand Ronde Indian Reservation.The chapter came together very quickly, in literally 3 months it was in finished form. In addition, I worked with Ken Ames to help with some additional maps into other sections of the book; maps created by the GIS Specialist at the Grand Ronde Tribe, Volker Mell. It was a good process, and I am immensely grateful to the editors for including our chapter. The January 2015 updates include news that the Chinookan Peoples book is chosen as one of the Outstanding Academic books for Choice 2014. This online review site is a primary source that academic libraries access to choose books for their collections.